Historic Druid Hills is an oasis in the Atlanta metropolitan area. Its park-like setting, wooded lots, and graceful curving roads are in sharp contrast to the automobile sprawl found in the suburbs to the east and north. Recognized as an historic district by the National Park Service, this neighborhood is one of the finest examples of urban planning in the Southeast. Druid Hills’ beauty and lush landscape are no accident. At the end of the 19th century Atlanta developer Joel Hurt’s vision of a large tract of land saddling the Ponce de Leon corridor was largely responsible for this incredible development. To ensure that his vision maintained its abundant greenery, in 1892 he hired Frederick Law Olmsted, one of America’s foremost landscape architects. This project, one of Olmsted’s last, represents the final evolution of his thinking about the relationship between suburban and urban areas. What makes living in Druid Hills special? 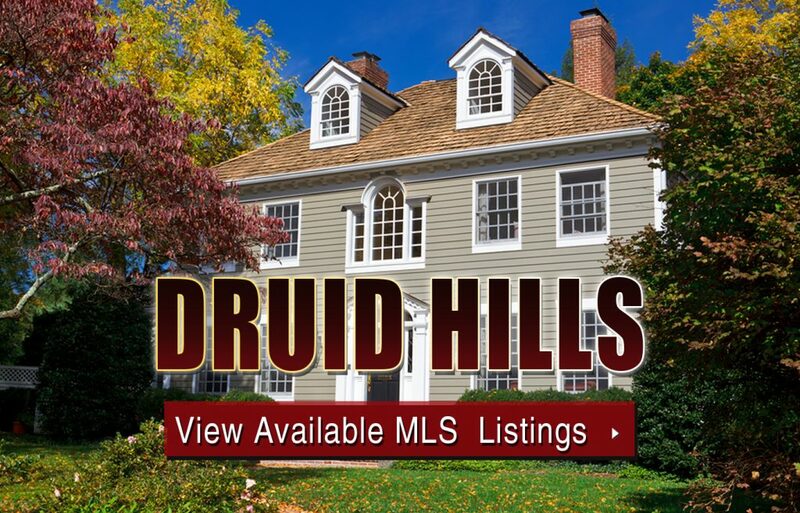 Before searching Druid Hills homes for sale, read more about the neighborhood below! Olmsted’s vision of majestic trees, roads that do not dominate the landscape but blend into the natural topography, and homes on large plots of land was a revolutionary departure from the city living of the time. Narrow lots and crowded homes would not be a part of this suburb. Olmsted’s associates who gained their experience from Druid Hills later worked on Ansley Park, Morningside, Garden Hills, and Avondale Estates. Druid Hills residents quickly realized that their suburb was definitely unique. By 1938, Druid Hills residents had formed a civic association to safeguard the integrity and heritage of the neighborhood. A drive through Druid Hills is testimony to their success. The architecture has been preserved; there are no cluster homes; the large, roomy lots have not been subdivided. Driving Miss Daisy put the neighborhood’s charms on the national stage. While not all homes here are as grand as “Miss Daisy’s,” they all, in some way or another, help express the original vision of Druid Hills. What area does Druid Hills take in? Depends on whom you ask! The National Park Service defines Druid Hills as being bounded by the Fulton County line on the west, Briarcliff Rd. to the northwest, just over the Emory Rd. line on the north and following the south side of Emory Rd. The boundary cuts south and juts east around the Fernbank Forest and Recreational Center, then cuts east and south along tracks of the Seaboard Coast Line. South it is bordered by North Ave. and the Atlanta City boundary. The Druid Hills Civic Association considers its boundaries to be somewhat greater, being bounded by South Fork Peachtree Creek on the north (including Emory University) and parts of the eastern edge of Morningside and Virginia-Highland. One major commercial district in this area is the small collections of shops and restaurants clustered around the entrance to Emory University. This area, known as Emory Village, caters to the university community, but is heavily patronized by residents of Druid Hills and beyond. There are excellent public schools for children in these neighborhoods, too. The Sage Hill shopping center — at the intersection of Clifton, Briarcliff, and Johnson Roads — is a purely utilitarian strip center. The Zonolite Road Business District — especially the Floataway Building — is an incubator of niche cultural and business concerns. Here you’ll find the Push-Push theater, The Floataway Cafe, and several edgy art galleries. The major cultural attractions belong, clearly, to Emory University. Foremost among these is the Michael C. Carlos Museum, focusing on ancient art. Its building was designed by Michael Graves. The Schwartz Center for the Performing Arts, Emory’s performance arts venue, occupies the corner at Clifton and N. Decatur. For decades, the performing arts at Emory had been hosted in the University’s sanctuary at Glenn Memorial Church. But with the opening of the Cannon Chapel, used as a chamber concert hall and theater, and now the Schwartz Center, Emory is taking itself seriously as an institution of the arts. Emory is also famous — or notorious (depending on how you feel about using apes in medical research) — for the Yerkes Primate Institute. You will find very little mention of it outside of researchers’ resumes or publications, however, as they would like the general public to forget it’s there. On a more positive note, however, the famous Winship Cancer Institute building is nearby. But it is the parkland that Druid Hills started with and what we should end with. The Olmstead Linear Park (previously called the Ponce de Leon Linear Park) comprises, from Briarcliff Road on the west to the Seaboard railroad tracks on the east, Springdale Park, Virgilee Park, Brightwood Park, Shady Side Park, Dellwood Park, and Deepdene Park. You will find a wonderful bicycle/walking path through these parks, starting at Virgilee Park and ending at Dellwood Park. These small urban oases remain, and they confer a halo effect on the entire area. Can’t find what you’re looking for in Atlanta’s Druid Hills neighborhood? Start browsing other Atlanta real estate for sale or give the Zac Team a call at (404) 564-7200 for help with your new home or condo search today!